In these lessons, we will look at some examples of the long division of whole numbers. For more practice in division, you could go to our Interactive Math Zone where you can learn the division facts, division (with or without remainder) and generate worksheets according to your needs and get them marked online. 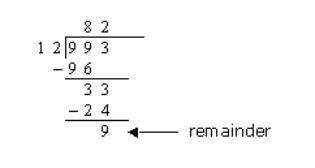 In division, the number called the dividend is divided by the divisor, and the result is called quotient. Step 1 : Start on the left. Check if first digit, 5, is bigger than the divisor 12. Since 5 is not, we need to take the next digit as well. 51 divided by 12 gives 4 as the quotient since 12 × 4 = 48. Step 2 : Write the number 48 below 51.Subtract 48 from 51 to get a remainder of 3. Bring down the next digit, 6, and write it after 3. Step 3 : Now repeat from Step 1. 36 divided by 12, gives 3. Write 3 above 6. Write the number 36 below 36. Subtract 36 from 36 to get a remainder of 0. Your answer is then 43. Step 1 : Start on the left. Check if first digit, 9, is bigger than the divisor 12. Since 9 is not, we need to take the next digit as well. 99 divided by 12 gives 8 as the quotient since 12 × 8 = 96. Step 2 : Write the number 96 below 99. Subtract 96 from 99 to get a remainder of 3. Bring down the next digit, 3, and write it after 3. Step 3 : Now repeat from Step 1. 33 divided by 12, gives 2. Write 2 above 3. Write the number 24 below 33. 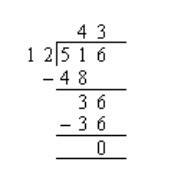 Subtract 24 from 33 to get a remainder of 9. Your answer is then 82 remainder 9. For division, the divisor cannot be 0. Example : 23 ÷ 0 is not permissible. The following video will show more examples of long division.